In order to stay ahead of the curve you need to be willing to change and adapt with what’s thrown at you. Whether it’s cutting off all your hair, moving to another country, or simply redecorating your room, change is needed to move forward. As a business owner your business has inevitably changed and so has your favorite social media platform. The thing is, Facebook still works, well. In this post I’m going to go over some things that have changed on Facebook and how you and your business can change along with it. Grab your pencil (with an eraser) and start thinking about how your business can adapt to these changes Facebook has laid out over the years. The value of a Like on Facebook isn’t what it used to be. Even if you have 1 million Likes, only a small portion of Facebook users are actually going to see what you’re posting. 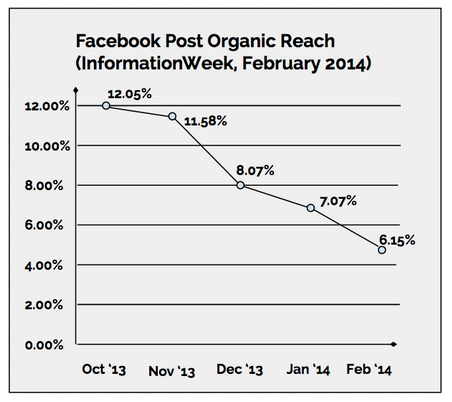 This decrease is due to the changes to Facebook’s organic reach algorithm over the past few years. In October 2013, the average Facebook post organically reached around 11-16 percent of that Page’s followers, Today that number is about five percent. Five percent of your fans – that’s not a whole lot. So now, instead of focusing on the pure number of Likes you get, you need to focus on generating engaged Fans, as engagement is a much more valuable metric than an individual Like. On November 5, 2014 Facebook removed ‘like-to see fan-gating’ from Facebook. This means that you’re no longer able to require someone to Like your business’ page for them to be able to access your own content. Now, instead of requiring someone to Like your Page in order to enter a contest, third-party platforms (like Wishpond) instead give visitors an option to Like your Page. This translates to people actually Liking your business because they want to and not because they’re required to. The bottom line is a Like isn’t going to count for much if the person doesn’t actually like or enjoy your business. You’re way better off to have less Likes and a higher percentage of Fans who actually want to engage with you and your content. This is especially important because of the drop in post reach. If your posts are only being shown to three percent of your Fans, wouldn’t you rather have that three percent be people who genuinely want to hear about what’s going on? Lots of people are guilty of liking pages they know nothing about. I have to admit that I’m guilty of, once in a while, liking Pages I know nothing about. I’ll Like a Page because my Friend has Liked it too or it’s a suggested post. I never actually go onto the Page and see what their content or business is really about. So while disengaged Likes on your Page might boost your ego, they aren’t going to increase your chance of someone purchasing your product. These useless Likes may also be taking attention away from people who could be engaged with your business, if given the chance. If you think you can just post something to Facebook and get tons of engagement without spending a dime, think again. For example, just two years ago a Walmart post like this would go live and be shown to a solid portion of their 30 million fans, resulting in strong engagement. 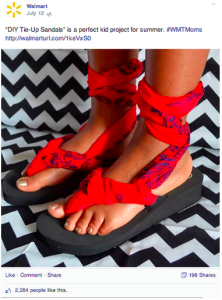 Wouldn’t you rather invest a couple bucks to reach your target market with valuable branded content than waste hours of your life brainstorming pithy posts that only get seen by a 20th of your Fan base? Just last month Facebook announced that it has reached 2 million active advertisers. That’s something many people didn’t predict after the original launch of sidebar ads over 4 years ago (News Feed ads only arrived in 2012). Many didn’t predict the soaring success of Facebook Ads, as the tool has improved drastically. Yes, in the beginning you could still target audiences based on age, gender, basic interests and Page Likes, but now it is so much more. You can now specifically target individuals based on where they work, where they live, places they’ve recently been or events they’ve attended. This means marketers can target you based on your last vacation destination, your new job title or relationship change or even if one of your close friend’s relationship status has recently changed to engaged (wedding gift ads galore). It sounds kind of creepy, but marketer to marketer, let me tell you, it is an amazing tool. What’s better than being able to stand out to the right group of people at the right time on a social network where they spend a sizeable amount of their time? Although it now costs marketers to use Facebook efficiently, Facebook Ads have evolved to be one of the best ways to reach audiences online, at any price. Custom audience – Custom audience allows you to target your ads specifically to those already in your database. This means you get to target existing leads or customers based on their email address or phone number. You upload your list of contact information and Facebook will match that data with their Facebook ID and ensure your ads are shown to that audience. Website custom audiences (WCA) – WCA allows you to target people who are interested in specific products. Say they look at the coats section of your website. You’re able to place a tracking pixel on that part of your website so that when they go back to Facebook they’ll be shown the coat they were looking at (but did not purchase) in a Facebook Ad format. Crafty hey? Lookalike audience – Within custom audiences you can also upload your current customer lists and create ads for a “lookalike audience.” This means that you can target individuals who are, as similar to your current customers as possible. helping you to broaden your consumer base. Over the past decade Facebook has constantly transformed in order to become a mecca for marketers. Even the past few years have seen great changes on the social platform. So what do you think the future has in store for Facebook marketers? Are you using Facebook to promote your business? Fill me in on your experiences in the comments below!